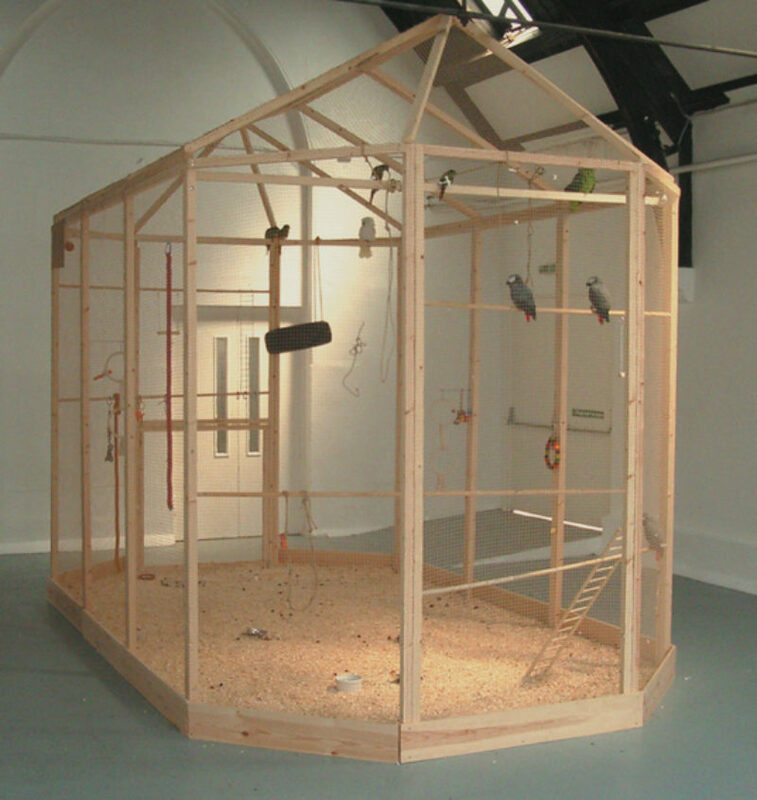 Earlier this summer, Ruth Ewan arranged for eleven talking birds to be shipped to London from a parrot sanctuary in Skegness to take up temporary residence at Studio Voltaire for ‘Psittaciformes Trying to Change the World’—‘psittaciformes’ being the scientific term for birds, such as parrots, cockatoos and parakeets, capable of mimicking the human voice. Having settled the birds into a purposebuilt aviary, Ewan invited the exhibition staff to introduce new phrases to the birds’ vocabulary using a basic command-training technique involving repetition and reward. The twist in this Pavlovian exercise was that they did so using field recordings made during the protests surrounding the G8 summit at Gleneagles in July 2005. Chants and slogans such as ‘What solution? Revolution!’ were repeated to the birds, along with songs such as ‘If You Want Trade Justice, Clap Your Hands’ (sung by an African woman to the tune of ‘If You’re Happy and You Know it’). Balanced on Ewan’s hand-made perches, ladders and swings, the exotic birds randomly uttered ‘hello’s, ‘uh-oh’s and wolf whistles to the gallery visitors until two of them learned to squawk ‘Revolution!’ and one mastered uttering the word ‘Sorry’ in a lazy American drawl. The installation also included a series of drawings on paper copied by a group of schoolchildren (in an informal off-the curriculum workshop organised by Ewan) from material sourced from the archives of the Socialist Party of Great Britain’s headquarters in Clapham High Street. These included ‘Get off Your Knees!’ by schoolboy Jamie Barker, whose handiwork was derived from a 1938 illustration in The Plebs magazine. The Plebs League believed that the working-class movement should create a system of independent education, free from capitalist ideology—a sentiment that seems quaint while Tory proposals to merge public services with business are carried forward in the form of Labour’s ‘skills’ academies. Ewan’s politics may hark back to those of The Plebs, but her interest lies both in playfully promoting certain ideologies and in exposing the point where a call for change has been co-opted. In the week following the G8 summit, the House of Commons applauded ‘faith groups, schools, businesses and many millions of concerned people attached to no formal organisation, [who] made their demands, protested for them reasonably and gave political leaders the support they needed to turn a campaign into a victory’. Through the government backing of ‘reasonable’ protestors, the voice of dissent became synonymous with the transparent attempt of the government to present its humanitarian face to a public previously gathered (and ignored) in protest to the war on Iraq. And just in case anyone couldn’t quite make the PR connection between the promise to end poverty and the official rationale for the Iraq travesty, the Commons report closed with the advice that delivering on the G8 pledges ‘would be the most poignant and powerful riposte to the forces of terrorism’. In a culture of ‘reasonable protest’ them political goal of the individual is simply ‘awareness’. Anti-propaganda is popularly realised through film, music and satire; while ‘what’s on’ guides tell us we can make a difference just by buying the DVDs and watching the show. ‘Psittaciformes Trying to Change the World’ and Ewan’s previous works, ‘A Jukebox of People Trying to Change the World’ and ‘A Colouring Book of People Trying to Stop the War’ resonate not only as a take on the neutralising of dissent through political assimilation, but also on the ‘performativity and commodification of the act itself.